Fast ROI compared to conventional fixed-lines. Typically less than 12 Months and lower OPEX than fixed-lines. Very fast deployment compared to conventional fixed-lines – Typically 10 working days or less from order. Carrier class wireless equipment with high availability and reliability = years of hassle free connectivity. From 2 to over 200 connections from a central point. Ideal for deployment in urban or rural locations. Also known as PtMP wireless. These radio systems use a ‘base station’ or Access Point to provide access to multiple subscribers. Distances between sites can be up to and in some cases over 3 km, depending on the number of subscriber sites, type of terrain and speeds required. Individual speeds can be as high as 100Mbps, but typically PtMP radios are used where subscriber site speed requirements are between 10 and 40Mbps. 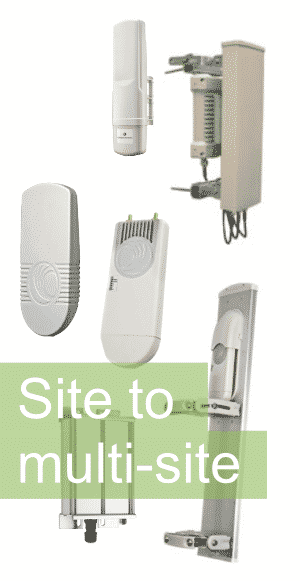 The subscriber (customer) units are typically very small and discrete, allowing for installation under ‘permitted development’ planning regulations. PtMP radio systems are often used in conjunction with Point to Point (PtP) radio systems to build complete networks, with the PtMP element providing the ‘last mile’ delivery mechanism. These radio systems are very flexible, allowing the transmission of data, voice and video with proper network planning. Planning/survey and careful implementation are key to the successful deployment of this technology; something in which Rapier Systems have many years’ experience. Software based tools allow for the modelling of radio propagation, channel planning and data flow balancing. These are used as a preliminary feasibility study, prior to the crucial site survey element. Rapier Systems uses technologies and systems from the leading wireless manufacturers to provide state of the art, high capacity links with carrier class reliability. Carefully selected products, combined with our skills, close manufacturer relationships and expertise in surveying, deploying, configuring and maintaining the systems means that our customers always get the service that they rightly deserve. Additionally, the support of these types of links allows for a very short SLA should anything go wrong – with typical response and fix times which are greatly reduced compared to those of the traditional telco providers, getting your connection and business back up and running quickly should an issue arise.